The BJP quite literally raised a storm with a tea-cup when every single BJP leader and minister from Centre or state-level did not miss having tea at makeshifts stalls while listening to the speech. AHMEDABAD: Nothing could have been more massive than this — ‘Mann ki baat, Chai ke saath’ — the event the BJP launched as a reply to the Youth Congress’ mocking meme on Prime Minister Narendra Modi’s ‘chaiwala’ past. The BJP quite literally raised a storm with a tea-cup. Not a single BJP leader or minister — from the Centre or state-level — worth his salt (or sugar) missed having tea at makeshifts stalls this Sunday, while they listened to the PM on the radio, across 50,812 polling booths in 182 Assembly seats of Gujarat. A big bang curtain raiser for the PM, who’s set to begin his Gujarat campaign from Monday. “A wall-to-wall coverage of the election-bound state which any political opponent, particularly the Congress, would find difficult to rival, this is our scientific method of campaigning,” a local BJP functionary, busy working the numbers to ensure every pranthpramukh was active, said. As the day began, Amit Shah, the BJP chief, sat on a charpoy sipping tea, in a rather sensitive area of Ahmedabad, the central market of Dariyapur — Tambu Chowk — surrounded by party workers and the local politico. The red carpet that had been rolled out for him was sprinkled with rose petals. This was no ordinary event or ordinary tea-stall. One Latif Sheikh gushed later: “Did you hear what the PM said — ‘Sab ka Saath, Sab ka Vikas’. 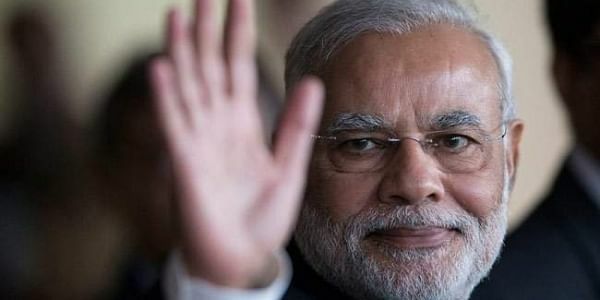 There’s no Hindu- Muslim divide in Gujarat, six crore Gujaratis support our man — the Prime Minister.” If the significance of the location was lost on the youngsters gathered around the venue, the BJP spokesperson was there to remind them — ‘this was the den of Abdul Latif ’ — a gangster from the hoary past who’s said to have dominated the scene 22 years ago. Latif was apparently a sidekick of Dawood Ibrahim. Congress’s Rahul Gandhi cited a media report on a drop in production of Nano cars at a Gujarat plant and said PM Narendra Modi’s pet ‘Make in India’ project “just died” turning Gujarati taxpayers’ D33,000 crore into “ash”.